What about uncommon genetic disease in the breed? Every individual carries recessive non-working or disease genes; many of which are uncommon and can run silently in the family for generations before two carriers are bred together and produce affected puppies. It has often been touted that one reason for inbreeding is to identify and weed out recessive disorders, but how often is this actually done? If the problem is uncommon and unknown, affected individuals, especially those that die young, can go undiagnosed, especially if each and every puppy is not extensively evaluated. So the problem occurs unrecognized, unidentified and can create heartbreak and still "no one has ever heard of that problem before". Is the tragedy of these any less than a dog that has hip dysplasia or may have cataracts identified with a CERF examination? In many cases the tragedy is actually far greater. Although it is difficult to quantitate the heartbreak created by disease or disorder, owners with these afflicted dogs spend time, energy and frustration trying to figure out what is wrong with their dog often to no avail. For a sad and poignant example, I would like to tell you the tragic story of Rigel. After much research, hope and expense came the anticipated arrival of Rigel and his sister, Trudy. Rigel was a beautiful and promising young male, a blue Afghan puppy from Germany named after the brightest star, the blue star, in the Orion constellation. Upon his arrival, Rigel seemed like a normal happy puppy although he was thin and "down in the pasterns." The breeder claimed that his weight was just his type, a more houndy dog, and that he had been running on hard surfaces related to the issues with his pasterns. As time went on, Rigel's health seemed to worsen; he did not gain weight and was lethargic. Exams revealed Coccidia that he was treated for, then Giardia and then Coccidia again. Trudy's symptoms mirrored Rigel's. They were believed to have arrived with infections and weakened immune systems but even once they were cleared of infections, they did not gain weight, they did not improve and Rigel's pasterns worsened. After more testing, more veterinary consultation, more treatments and more money, Rigel's symptoms continued to worsen. He had two seizures, his rear legs were weaker and his hocks were slipping. Rigel and Trudy were taken to perspective universities in their parts of the country. No diagnosis was made for Rigel after many tests and consultation with many different specialists; however, one of the specialists who evaluated Trudy felt that she had a lysosomal storage disease. Now urine and blood samples were sent on both brother and sister to University of Pennsylvania Metabolic Testing Laboratory. They were both ultimately diagnosed with Mucopolysaccharidosis Type 1 (MPS 1). Lysosomes break down unwanted matter in the cells. Rigel and Trudy were missing one of the important enzymes for doing this. MPS 1 is an autosomal recessive disease. This diagnosis meant that Rigel and Trudy's symptoms would continue to worsen and their deaths were only a matter of time. At 17 months of age, Rigel's owner decided that he could take no more and let him go peacefully. Because MPS 1 is an autosomal recessive genetic disorder, this means that both of Rigel and Trudy's parents are carriers, and at least one of each of their grandparents are carriers. All relatives have a significant chance to be carriers. Yet "no one in the breed had ever heard of this problem before". There are, however, stories and mentions of Afghans that die at 2-3 years of age with "mysterious symptoms". If it were not for one astute veterinarian at Ohio State University and the bravery of Rigel and Trudy's owners (and a few other people that helped them) in telling their tale, still no one would have ever heard of this disorder that has potentially been silently killing Afghan Hounds. These stories are not things that people want to hear or that people like to talk about, but this recognition and sharing of information is needed in order for the presence of such disorders to be recognized and addressed. Paw Print Genetics offers two approaches to testing. First, for symptomatic dogs for which a specific mutation has not been identified in a breed (or perhaps the dog is a mixed breed), you can test for all the gene mutations that result in specific symptoms that are present in your dog. For example, seizures, abnormal bleeding or, in this case, all the mutations that result in mucopolysaccharidoses. The second approach is the use of panels of DNA mutations based on gene mutations that researchers have identified in each breed. "No one in the breed may have heard of this problem before" but dogs of the breed have specifically been identified with the disorders included in each breed panel. Like MPS1 in the Afghan, these disorders can run in a family or line for many generations before affected puppies are produced, recognized and diagnosed. Similar to neuronal ceroid lipofuscinosis that "is primarily in Australian lines" but affected dogs are listed in the US Border Collie health database. Or similar to sensory ataxic neuropathy (SAN) found in Golden Retrievers, these dogs are also often euthanized by the age of three. Or like X-linked myotubular myopathy in the Labrador retriever. Considering that this condition is X-linked, any Labrador retriever cross could have a risk to develop this severe and rapidly progressive disease. Or like any of the many other disorders and diseases for which Paw Print Genetics is providing DNA testing. These tests are incredibly cost effective and we recommend ordering of the entire panel specific for your breed as an approach to genetic testing in order to diminish the possibility for tragic tales like Rigel's. Thank you for being brave enough to share your story. I have had an afghan before and am looking to get another one sometime. I will be watching for this. Thank you! In the article you imply that there is a test for this condition in Afghan Hounds, yet when I search for tests on Afghan Hounds I get no tests available. 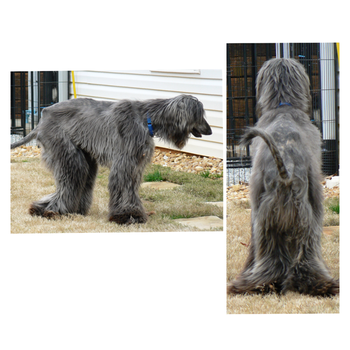 Can you please clarify if you currently have a test for this condition in Afghan hounds? Thank you Cy-I will pass your gratitude on to Calvena Evans, Rigel's owner, and to Trudy's owner as well. This is a newly identified disorder in the Afghan. There is no idea how prevalent the disorder is and no genetic testing yet available. Screening was done for the know MPS I mutation in dogs---but this was negative illustrating how different mutations in a single gene can result in the same disease. In some cases a mutation in different genes can result in the same general disease. Mucopolysaccharidoses are a group of particularly debilitating disorders and we hope that the gene mutation for this form of MPS I can be identified quickly. I know that all involved will hope for definitive answers related to this disorder as soon as possible. I believe that researchers at University of Pennsylvania are working with Ms Evans and any other interested parties. Yes Carol-we provide testing for Trapped neutrophil syndrome. Specifically the gene mutation that has been found to cause this disease in the Border Collie. So assuming that your breed is Border Collies-then yes we offer testing for the TNS gene mutation found in your breed. If you have a different breed--then we would first need to test a dog affected with TNS in the breed to see if they had the mutation found in Border Collies that we offer testing for. If not---then the TNS testing would not be informative for identifying TNS in that breed. There are DNA tests available for multiple form of MPS including a DNA test for MPS I. Rigel was tested for the know canine MPS 1 causing gene mutation and did not have this mutation. This illustrates how the same disease can be caused by different mutations and that is the case with Rigel and Trudy. Through research participation of these dogs and their relatives, we hope that this mutation will be found quickly and allow for informative genetic testing for this condition in the breed sooner rather than later.